During the heat of summer I settled in my couch to watch the first college football game I would watch for the year as the 14th ranked TCU Horned Frogs were facing the unranked Baylor Bears. After a quarter of the game, my attention was fixated on one player in particular; Robert Griffin III. After a 5 touchdown, 50-48 win over TCU, Griffin’s legend was born. The success of Robert Griffin III could go a long way in shifting the way NFL general managers think about black, almost synonymous with mobile, quarterbacks. Griffin is a former track star that possess the kind of speed many NFL wide receivers dream of. However throughout this season, Griffin has been one of the most efficient passers in college football, ranking 4th in completion percentage. His 37 passing touchdowns aren’t the only things that have general managers buzzing about him. Griffin is a humble yet determined leader that has 4 years of college experience. Over recent years quarterbacks such as Vince Young, Tavaris Jackson, Troy Smith, and (who could forget) Jamarcus Russell have been drafted while facing much scrutiny about size, mental competency, work ethic, and/or “it” factor. Other than Russell, each of these quarterbacks were expected to use their “athletic prowess” rather than intellectual skill to succeed in the NFL. None of these questions have been raised about Griffin, or RG3 as he’s called. If RG3 were to enter the league and prove that he can be a top quarterback, a year after Cam Newton entered the league and silenced doubters, black quarterbacks would have as much momentum as they ever have. Both quarterbacks do much of their damage from the pocket with their arm, only deciding to run when they need to. A study conducted at the Fuqua School of Business at Duke University confirmed that the lack of confidence in black quarterbacks as leaders, coincides with a societal view that white individuals are viewed as more effective leaders. The statistical analysis showed the being white was an attribute of the “business leader prototype”. This is highly influential in how people view quarterbacks. “Quarterback” is the biggest illustration of a leader in sports. Just google it (See below). With quarterbacks like Newton and hopefully Griffin, a foundation of “non-prototypical” NFL leader could be established. There is a long way to go to determine whether Griffin can translate his skill set to the next level. If he can, this would be a big step in changing how people credit the success of black quarterbacks, and maybe start to change the perception of black leaders everywhere. *Duke University Graduate School study showing that if you google the word “leader”, you will find the find the number of hits above for each corresponding sports position. This is a great article and the writer seemed to have been very knowledgeable about its contents. Great Job. GREAT write up Bryan. 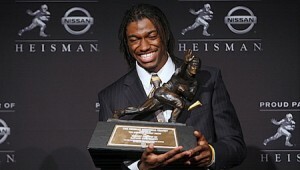 I totally agree, RGIII not only possesses the skill, but also the poise off field. I hope there can be a continuance of this for years to come. Many Black quarterbacks are perceived as awesome scramblers most recently, that we forget the Warren Moons who have played before them. 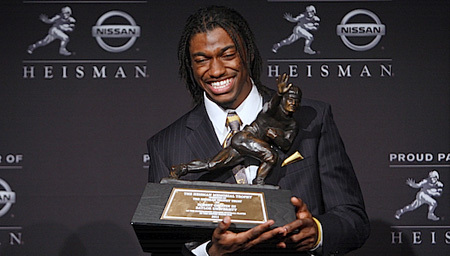 Before I even knew who RGIII was I was definitely a Denard Robinson fan. Look forward to other write ups! Honestly I didn’t no much about RG3, except for the fact that he likes to wear superman socks lol. I will defiantly keep an eye out for him from here on out. Thanks for the informative article Bryan. Great article man. It is unfortunate the societal hurdles and pre/misconceptions that black quarterbacks have to endure. Will that end with the success of the Cam Newton and the RGIIIs of the world – I doubt it, but it is always nice to stick it to the man when you can! This brings up an excellent point man. The traditional “leader” image is on the verge of being shattered in a positve way. You said something key in that he only runs when he needs to. This places him on a level far greater to any of his counterparts.Great article bro. Nice article nephew!! I totally agree..Ur unc used to work them as a young QB! Ask ur mom……LOL…. Luv You..